This article is about the navigational instrument. For other meanings, see rudder (disambiguation). For mythological meaning, see gubernaculum (classical). A rudder is a primary control surface used to steer a ship, boat, submarine, hovercraft, aircraft, or other conveyance that moves through a fluid medium (generally air or water). On an aircraft the rudder is used primarily to counter adverse yaw and p-factor and is not the primary control used to turn the airplane. A rudder operates by redirecting the fluid past the hull (watercraft) or fuselage, thus imparting a turning or yawing motion to the craft. In basic form, a rudder is a flat plane or sheet of material attached with hinges to the craft's stern, tail, or after end. Often rudders are shaped so as to minimize hydrodynamic or aerodynamic drag. On simple watercraft, a tiller—essentially, a stick or pole acting as a lever arm—may be attached to the top of the rudder to allow it to be turned by a helmsman. In larger vessels, cables, pushrods, or hydraulics may be used to link rudders to steering wheels. In typical aircraft, the rudder is operated by pedals via mechanical linkages or hydraulics. Generally, a rudder is "part of the steering apparatus of a boat or ship that is fastened outside the hull", that is denoting all different types of oars, paddles, and rudders. More specifically, the steering gear of ancient vessels can be classified into side-rudders and stern-mounted rudders, depending on their location on the ship. A third term, steering oar, can denote both types. In a Mediterranean context, side-rudders are more specifically called quarter-rudders as the later term designates more exactly the place where the rudder was mounted. 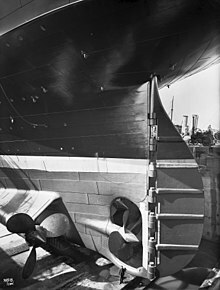 Stern-mounted rudders are uniformly suspended at the back of the ship in a central position. A single sail tends to turn a vessel in an upwind or downwind direction, and rudder action is required to steer a straight course. A steering oar was used at this time because the rudder had not yet been invented. With a single sail, a frequent movement of the steering oar was required to steer a straight course; this slowed down the vessel because a steering oar (or rudder) course correction acts like a brake. 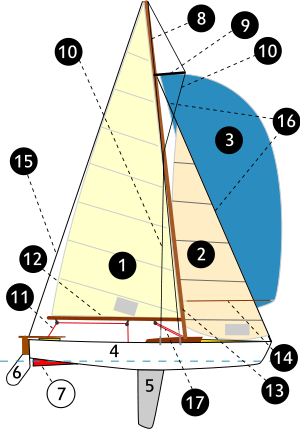 The second sail, located forward, could be trimmed to offset the turning tendency of the main sail and minimize the need for course corrections by the steering oar, which would have substantially improved sail performance. The steering oar or steering board is an oversized oar or board to control the direction of a ship or other watercraft prior to the invention of the rudder. It is normally attached to the starboard side in larger vessels, though in smaller ones it is rarely, if ever, attached. Rowing oars set aside for steering appeared on large Egyptian vessels long before the time of Menes (3100 BC). In the Old Kingdom (2686 BC-2134 BC) as many as five steering oars are found on each side of passenger boats. The tiller, at first a small pin run through the stock of the steering oar, can be traced to the fifth dynasty (2504–2347 BC). Both the tiller and the introduction of an upright steering post abaft reduced the usual number of necessary steering oars to one each side. Single steering oars put on the stern can be found in a number of tomb models of the time, particularly during the Middle Kingdom when tomb reliefs suggests them commonly employed in Nile navigation. The first literary reference appears in the works of the Greek historian Herodotus (484-424 BC), who had spent several months in Egypt: "They make one rudder, and this is thrust through the keel", probably meaning the crotch at the end of the keel (see right pic "Tomb of Menna"). In Iran, oars mounted on the side of ships for steering are documented from the 3rd millennium BCE in artwork, wooden models, and even remnants of actual boats. Steering oar of a Roman boat, 1st century AD (RG-Museum, Cologne). Roman navigation used sexillie quarter steering oars that went in the Mediterranean through a long period of constant refinement and improvement, so that by Roman times ancient vessels reached extraordinary sizes. The strength of the steering oar lay in its combination of effectiveness, adaptability and simpleness. Roman quarter steering oar mounting systems survived mostly intact through the medieval period. By the first half of the 1st century AD, steering gear mounted on the stern were also quite common in Roman river and harbour craft as proved from reliefs and archaeological finds (Zwammderdam, Woerden 7). A tomb plaque of Hadrianic age shows a harbour tug boat in Ostia with a long stern-mounted oar for better leverage. The boat already featured a spritsail, adding to the mobility of the harbour vessel. Further attested Roman uses of stern-mounted steering oars includes barges under tow, transport ships for wine casks, and diverse other ship types. Also, the well-known Zwammerdam find, a large river barge at the mouth of the Rhine, featured a large steering gear mounted on the stern. According to new research, the advanced Nemi ships, the palace barges of emperor Caligula (37-41 AD), may have featured 14 m long rudders. An Eastern Han (25–220 AD) Chinese pottery boat fit for riverine and maritime sea travel, with an anchor at the bow, a steering rudder at the stern, roofed compartments with windows and doors, and miniature sailors. The world's oldest known depiction of a sternpost-mounted rudder can be seen on a pottery model of a Chinese junk dating from the 1st century AD during the Han Dynasty, predating their appearance in the West by a thousand years. In China, miniature models of ships that feature steering oars have been dated to the Warring States period (c. 475–221 BC). Sternpost-mounted rudders started to appear on Chinese ship models starting in the 1st century AD. However, the Chinese continued to use the steering oar long after they invented the rudder, since the steering oar still had limited practical use for inland rapid-river travel. One of oldest known depiction of a stern-mounted rudder in China can be seen on a 2-foot-long tomb pottery model of a junk dating from the 1st century AD, during the Han Dynasty (202 BC-220 AD). It was discovered in Guangzhou in an archaeological excavation carried out by the Guangdong Provincial Museum and Academia Sinica of Taiwan in 1958. Within decades, several other Han Dynasty ship models featuring rudders were found in archaeological excavations. The first solid written reference to the use of a rudder without a steering oar dates to the 5th century. 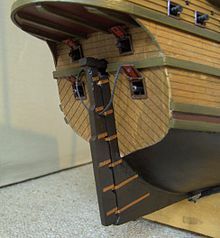 Chinese rudders were not supported by pintle-and-gudgeon as in the Western tradition; rather, they were attached to the hull by means of wooden jaws or sockets, while typically larger ones were suspended from above by a rope tackle system so that they could be raised or lowered into the water. Also, many junks incorporated "fenestrated rudders" (rudders with holes in them, supposedly allowing for better control). 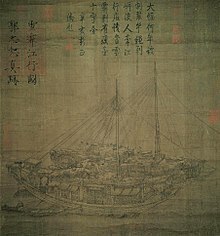 Detailed descriptions of Chinese junks during the Middle Ages are known from various travellers to China, such as Ibn Battuta of Tangier, Morocco and Marco Polo of Venice, Italy. The later Chinese encyclopedist Song Yingxing (1587–1666) and the 17th-century European traveler Louis Lecomte wrote of the junk design and its use of the rudder with enthusiasm and admiration. Paul Johnstone and Sean McGrail state that the Chinese invented the "median, vertical and axial" sternpost-mounted rudder, and that such a kind of rudder preceded the pintle-and-gudgeon rudder found in the West by roughly a millennium. The captain from the crow's nest carefully observes the sea. When a rock is espied, he shouts: "Starboard!" or 'Port!" Two youths, posted there, repeat the cry. The helmsman, with two ropes in his hand, when he hears the calls tugs one or the other to the right or left. If great care is not taken, the ship strikes the rocks and is wrecked. Oars mounted on the side of ships evolved into quarter steering oars, which were used from antiquity until the end of the Middle Ages in Europe. As the size of ships and the height of the freeboards increased, quarter steering oars became unwieldy and were replaced by the more sturdy rudders with pintle and gudgeon attachment. 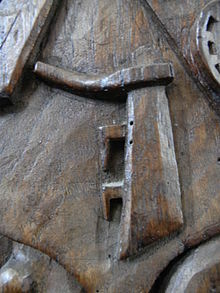 While Steering oars were found in Europe on a wide range of vessels since Roman times, including light war galleys in Mediterranean,the oldest known depiction of a pintle-and-gudgeon rudder can be found on church carvings of Zedelgem and Winchester dating to around 1180. Boat rudders may be either outboard or inboard. Outboard rudders are hung on the stern or transom. Inboard rudders are hung from a keel or skeg and are thus fully submerged beneath the hull, connected to the steering mechanism by a rudder post that comes up through the hull to deck level, often into a cockpit. Inboard keel hung rudders (which are a continuation of the aft trailing edge of the full keel) are traditionally deemed the most damage resistant rudders for off shore sailing. Better performance with faster handling characteristics can be provided by skeg hung rudders on boats with smaller fin keels. Rudder post and mast placement defines the difference between a ketch and a yawl, as these two-masted vessels are similar. Yawls are defined as having the mizzen mast abaft (i.e. "aft of") the rudder post; ketches are defined as having the mizzen mast forward of the rudder post. Small boat rudders that can be steered more or less perpendicular to the hull's longitudinal axis make effective brakes when pushed "hard over." However, terms such as "hard over," "hard to starboard," etc. signify a maximum-rate turn for larger vessels. Transom hung rudders or far aft mounted fin rudders generate greater moment and faster turning than more forward mounted keel hung rudders. Rudders on smaller craft can be operated by means of a tiller that fits into the rudder stock that also forms the fixings to the rudder foil. Craft where the length of the tiller could impede movement of the helm can be split with a rubber universal joint and the part adjoined the tiller termed a tiller extension. Tillers can further be extended by means of adjustable telescopic twist locking extension. There is also the barrel type rudder, where the ship's screw is enclosed and can be swiveled to steer the vessel. Designers claim that this type of rudder on a smaller vessel will answer the helm faster. Movement caused by the use of rudder. The water rudders on this Cessna 208 Caravan floatplane are the small vertical surfaces on the rear end of each float. Their setting is controlled from the cockpit. On an aircraft, the rudder is a directional control surface along with the rudder-like elevator (usually attached to the horizontal tail structure, if not a slab elevator) and ailerons (attached to the wings) that control pitch and roll, respectively. The rudder is usually attached to the fin (or vertical stabilizer), which allows the pilot to control yaw about the vertical axis, i.e., change the horizontal direction in which the nose is pointing. The rudder's direction in aircraft since the "Golden Age" of flight between the two World Wars into the 21st century has been manipulated with the movement of a pair of counter-moving foot pedals by the pilot, while during the pre-1919 era rudder control was most often operated with by a center-pivoted, solid "rudder bar" that usually had pedal and/or stirrup-like hardware on its ends to allow the pilot's feet to stay close to the ends of the bar's rear surface. In practice, both aileron and rudder control input are used together to turn an aircraft, with the ailerons imparting roll and the rudder imparting yaw and also compensating for a phenomenon called adverse yaw. A rudder alone will turn a conventional fixed-wing aircraft, but much more slowly than if ailerons are also used in conjunction. Use of rudder and ailerons together produces coordinated turns, in which the longitudinal axis of the aircraft is in line with the arc of the turn, neither slipping (under-ruddered), nor skidding (over-ruddered). Improperly ruddered (uncoordinated) turns at low speed can precipitate a spin that can be dangerous at low altitudes. Sometimes pilots may intentionally operate the rudder and ailerons in opposite directions in a maneuver called a slip. This may be done to overcome crosswinds and keep the fuselage in line with the runway, or to more rapidly lose altitude by increasing drag, or both. The pilots of Air Canada Flight 143 used a similar technique to land the plane as it was too high above the glideslope. Any aircraft rudder is subject to considerable forces that determine its position via a force or torque balance equation. In extreme cases these forces can lead to loss of rudder control or even destruction of the rudder, as on American Airlines Flight 587 (the same principles also apply to water vessels, of course, but it is more important for aircraft because they have lower engineering margins). Maximum rudder deflection is controlled by a rudder travel limiter. The largest achievable angle of a rudder in flight is called its blowdown limit; it is achieved when the force from the air or blowdown equals the maximum available hydraulic pressure. In multi-engined aircraft where the engines are positioned off the centre line, the rudder may be used to compensate for the yaw effect of asymmetric thrust, which can occur if the engines are not producing an equal amount of power or in the event of engine failure. Further, on large jet airliners, the rudder is mainly used to align the aircraft with the runway during crosswind landing and take-off. For taxiing and during the beginning of the take-off, aircraft are steered by a combination of rudder input as well as turning the nosewheel or tailwheel. At slow speeds the nosewheel or tailwheel has the most control authority, but as the speed increases the aerodynamic effects of the rudder increases, thereby making the rudder more and more important for yaw control. In some aircraft (mainly small aircraft) both of these mechanisms are controlled by the rudder pedals so there is no difference to the pilot. In other aircraft there is a special tiller controlling the wheel steering and the pedals control the rudder, and a limited amount of wheel steering (usually 5 degrees of nosewheel steering). For these aircraft the pilots stop using the tiller after lining up with the runway prior to take-off, and begin using it after landing before turning off the runway, to prevent over correcting with the sensitive tiller at high speeds. The pedals may also be used for small corrections while taxing in a straight line, or leading in or out of a turn, before applying the tiller, to keep the turn smooth. Trim tabs are small surfaces connected to the trailing edge of a larger control surface, such as a rudder on an aircraft, that are used to control the trim of the controls, i.e., to counteract aerodynamic forces and stabilise the aircraft in a particular desired attitude without the need for the operator to constantly apply a control force. This is done by adjusting the angle of the tab relative to the larger surface. Changing the setting of a trim tab adjusts the neutral or resting position of a control surface (such as an elevator or rudder). As the desired position of a control surface changes (corresponding mainly to different speeds), an adjustable trim tab will allow the operator to reduce the manual force required to maintain that position—to zero, if used correctly. Thus the trim tab acts as a servo tab. Because the center of pressure of the trim tab is further away from the axis of rotation of the control surface than the center of pressure of the control surface, the movement generated by the tab can match the movement generated by the control surface. The position of the control surface on its axis will change until the torque from the control surface and the trim surface balance each other. ^ Joseph Needham, Lefèbre des Noëttes, K.S. Tom, Chung Chee Kit, S.A.M. Adshead, John K. Fairbank, Merle Goldman, Frank Ross, and Leo Block. ^ a b c d e f Tom, K.S. (1989). Echoes from Old China: Life, Legends, and Lore of the Middle Kingdom. Honolulu: The Hawaii Chinese History Center of the University of Hawaii Press. ISBN 0-8248-1285-9. Page 103–104. ^ a b c d Needham, Volume 4, Part 3, 649-650. ^ a b c d Adshead, Samuel Adrian Miles. (2000). China in World History. London: MacMillan Press Ltd. New York: St. Martin's Press. ISBN 0-312-22565-2. Page 156. ^ a b c Needham, Joseph. (1986). Science and Civilization in China: Volume 4, Physics and Physical Technology, Part 3, Civil Engineering and Nautics. Taipei: Caves Books Ltd. Pages 627–628. ^ Chung, Chee Kit. (2005). "Longyamen is Singapore: The Final Proof?," in Admiral Zheng He & Southeast Asia. Singapore: Institute of Southeast Asian Studies. ISBN 981-230-329-4. Page 152. ^ Fairbank, John K. and Merle Goldman. (1998). China: A New History, Enlarged Edition. Cambridge: Harvard University Press. ISBN 0-674-11673-9. Page 93. ^ Ross, Frank. (1982). Oracle Bones, Stars, and Wheelbarrows: Ancient Chinese Science and Technology. New York: Houghton Mifflin. ISBN 0-395-54967-1. ^ Block, Leo. (2003). To Harness the Wind: A Short History of the Development of Sails. Annapolis: Naval Institute Press. ISBN 1-55750-209-9. Page 123. ^ Block, Leo. (2003). To Harness the Wind: A Short History of the Development of Sails. Annapolis: Naval Institute Press. ISBN 1-55750-209-9. 8–9. ^ Francesco Tiradritti (ed. ): “The Treasures of the Egyptian Museum”, The American University in Cairo Press, Cairo 1999, ISBN 978-977-424-504-6, p.92f. ^ Lawrence V. Mott, The Development of the Rudder, A.D. 100-1600: A Technological Tale, Thesis May 1991, Texas A&M University, p.84, 95f. ^ M. D. de Weerd: Ships of the Roman Period at Zwammerdam / Nigrum Pullum, Germania Inferior, in: Roman Shipping and Trade: Britain and the Rhine Provinces. (The Council for) British Archaeology, Research Report 24, 1978, 15ff. ^ M. D. de Weerd: Römerzeitliche Transportschiffe und Einbäume aus Nigrum Pullum / Zwammerdam, in: Studien zu den Militärgrenzen Roms II (1977), 187ff. ^ a b c d e f Johnstone, Paul and Sean McGrail. (1988). The Sea-craft of Prehistory. New York: Routledge. ISBN 0-415-02635-0. Page 191. ^ a b Fairbank, 192. ^ Deng, Gang. (1997). Chinese Maritime Activities and Socioeconomic Development, c. 2100 B.C.-1900 A.D. Westport: Greenwood Press. ISBN 0-313-29212-4. Page 42. ^ a b Needham, Volume 4, Part 3, 362. ^ Needham, Volume 4, Par634. ^ Lawrence V. Mott, p.92f. ^ Lawrence V. Mott, The Development of the Rudder, A.D. 100-1600: A Technological Tale, Thesis May 1991, Texas A&M University, S.2, 92f. ^ a b Lawrence V. Mott, The Development of the Rudder, A.D. 100-1600: A Technological Tale, Thesis May 1991, Texas A&M University, S.118f. 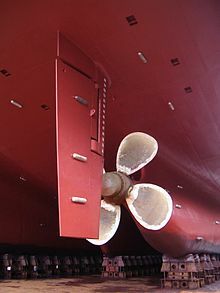 Look up rudder in Wiktionary, the free dictionary. Wikimedia Commons has media related to Rudders.